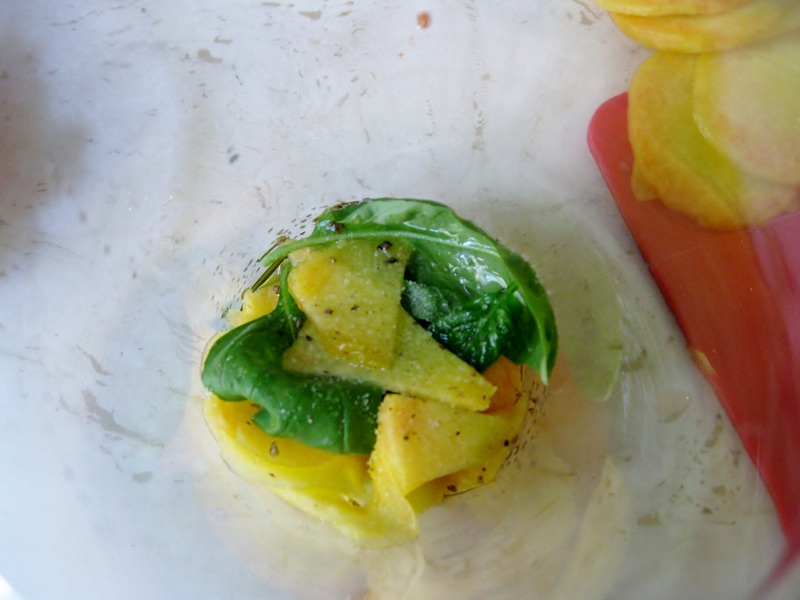 There are some recipes that scream “Summer”, such as the one I am about to present. However, I will not take credit for it since I got my inspiration from an appetizer I ate about a year ago (yes I happen to remember what I ate last year!!) at Duke’s Restaurant in Rome (www.dukes.it). Unfortunately, this year that appetizer is not on the menu anymore!! Therefore, I decided to make my own version of it. 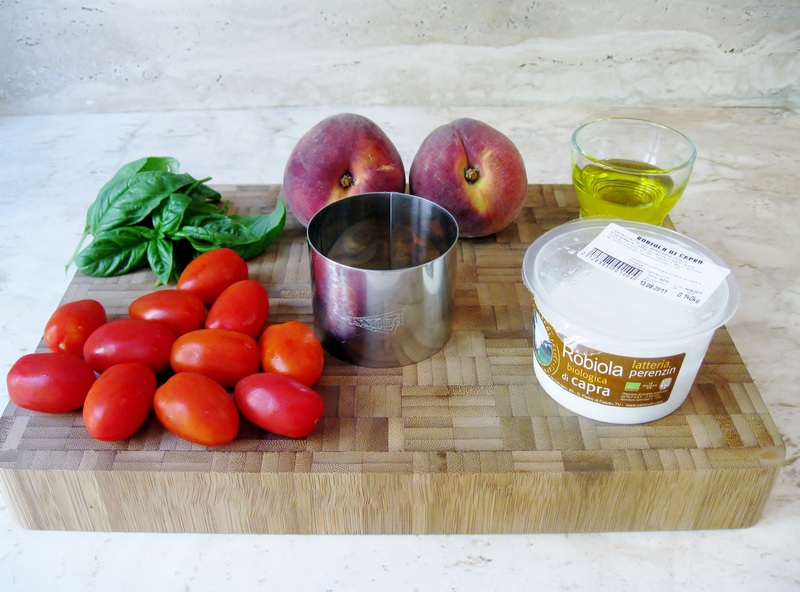 “Marble breeze” was the name of the appetizer, which included tomatoes, peaches, fresh cheese and basil. 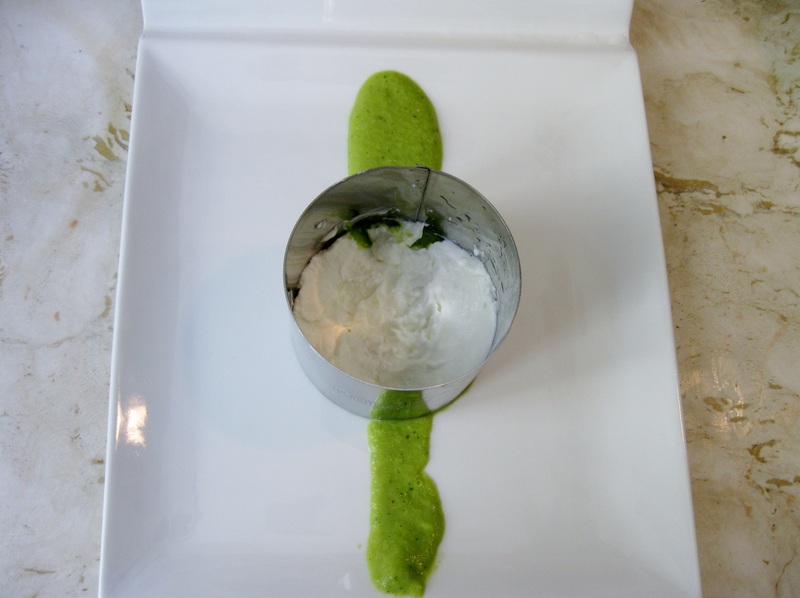 As the name recalls a breeze of fresh air, it was one of the freshest, most creative dishes I have ever tasted – a perfect summer treat. Most importantly, it never crossed my mind to pair tomatoes with peaches. I also loved the fact that it did not require any cooking, which is a common preparation method in Italian summer dishes. 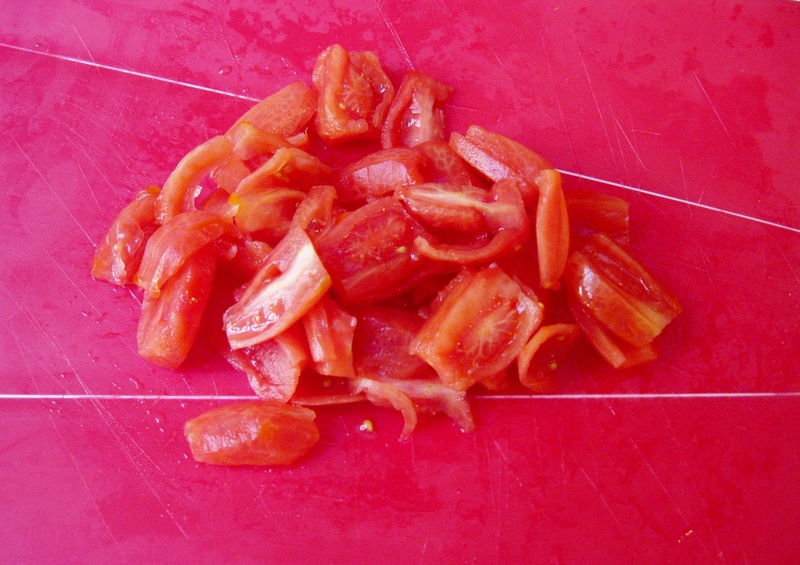 Cut the ends of each tomato and peel them. 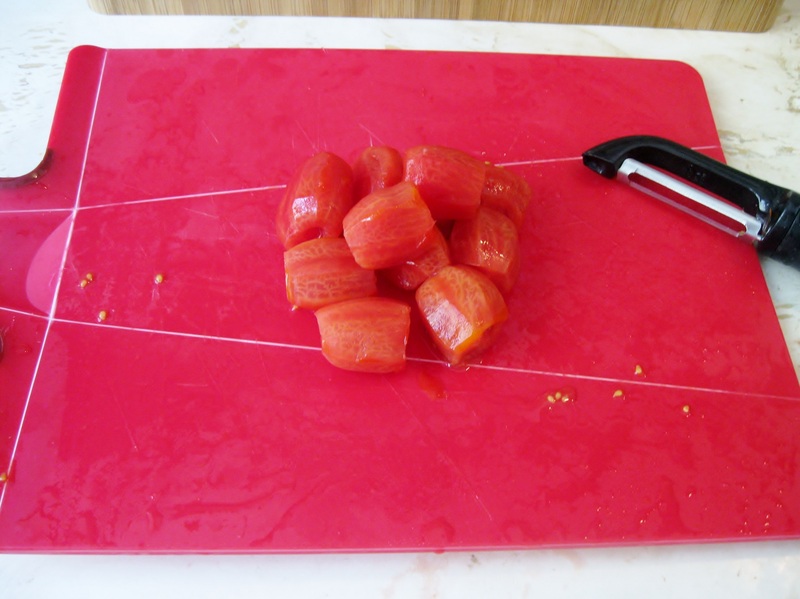 Slice tomatoes lengthwise into 3 – 4 slices. Discard seeds. Using a mandolin, slice peaches. 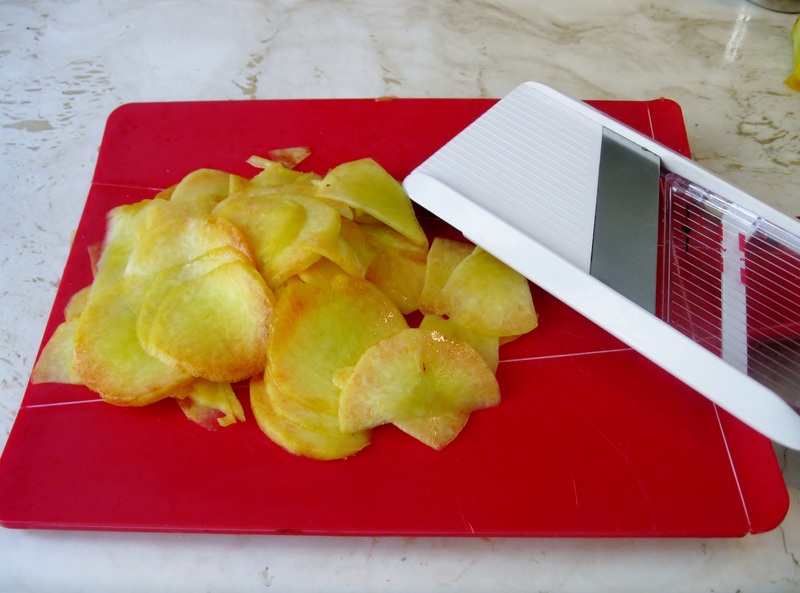 Begin slicing one side, then the other side. You have to slice all 4 sides of the peach. Try to get as much pulp as you can. Since you are not going to get all round slices, keep the half-moon slices for making the sauce. 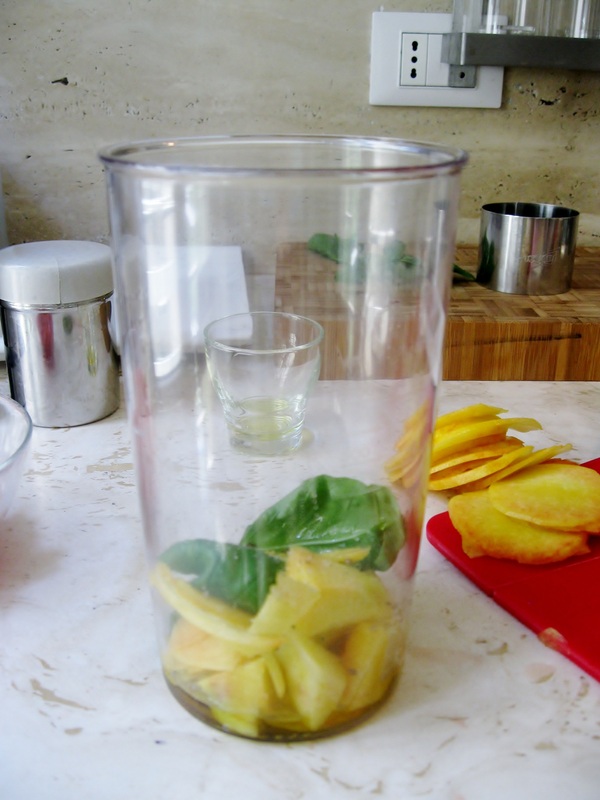 To prepare the sauce, place half-moon peach slices, 6 basil leaves, and 25 ml of extra virgin olive oil on a blending beaker. Add salt and pepper to taste. Blend all ingredients until you get a creamy consistency. About 2-3 minutes. 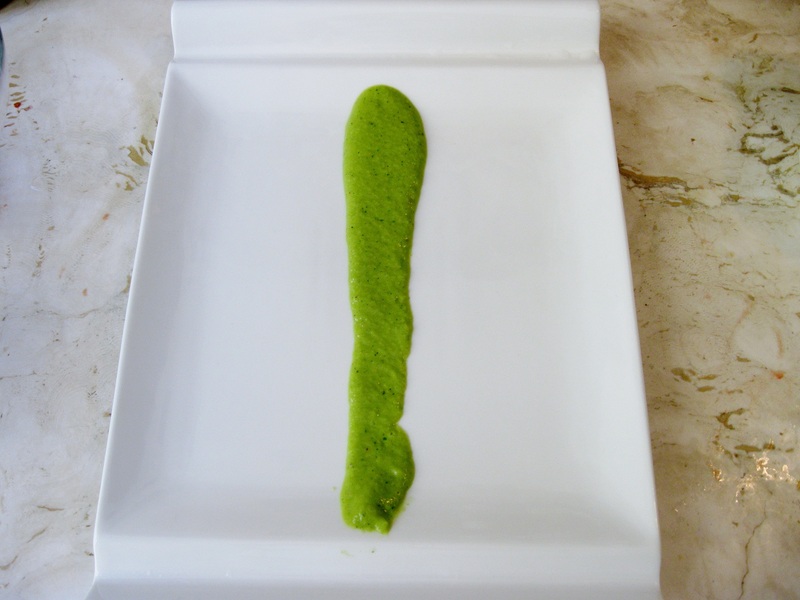 Using a tablespoon, place the sauce onto a plate by forming a thick line. 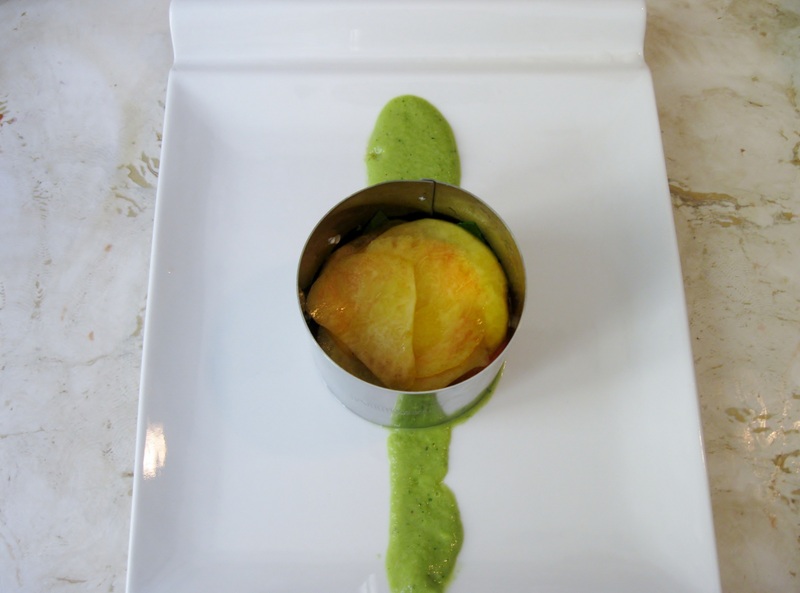 Place the round metal pastry cutter in the middle. 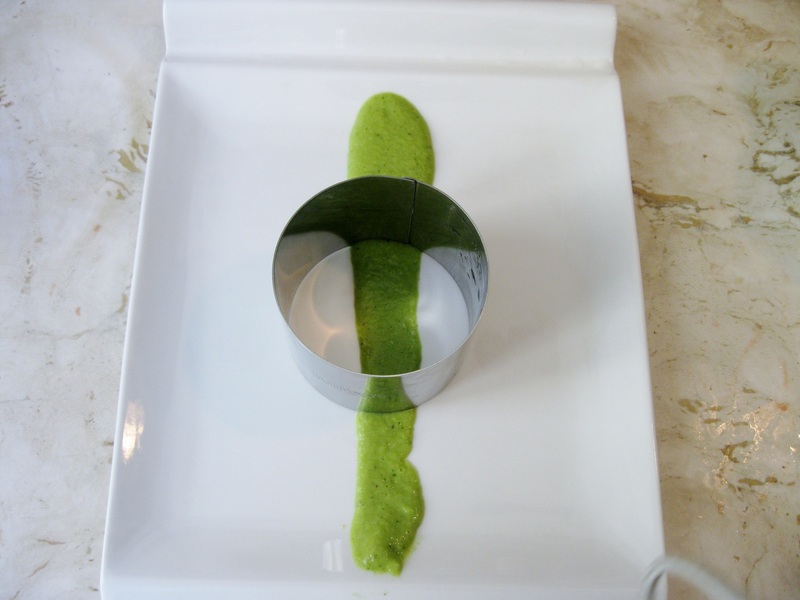 Spread goat cheese in the bottom of the round cutter. Add one hand cut basil leave. Continue layering until you place peaches on top. 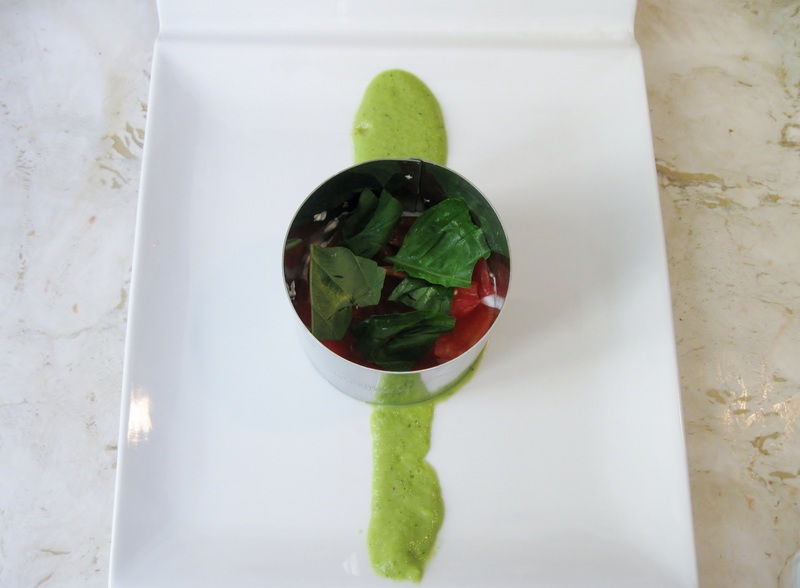 Add one tomato end and two small basil leaves fo garnish. Before taking the pastry cutter off, leave it for about 15 minutes to allow the cake to settle. 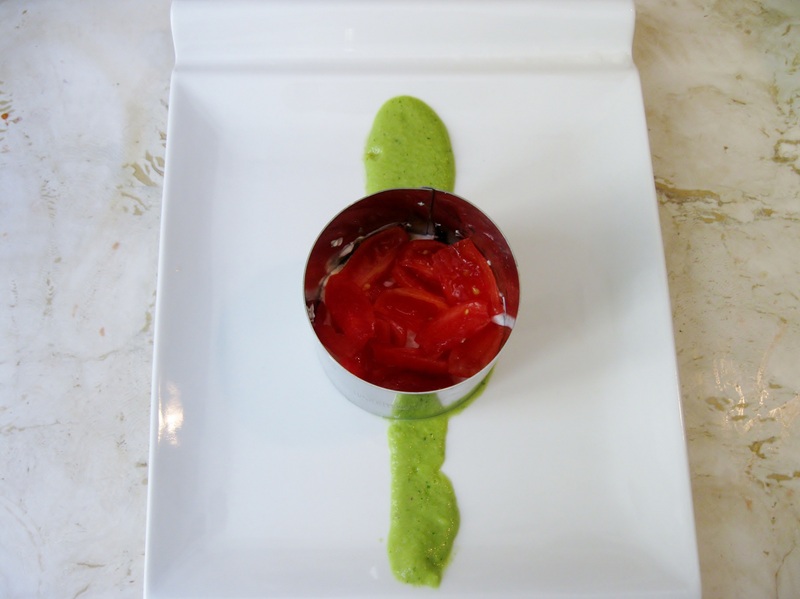 What an incredible combination of flavours – and how beautiful the assemlbed dish looks. 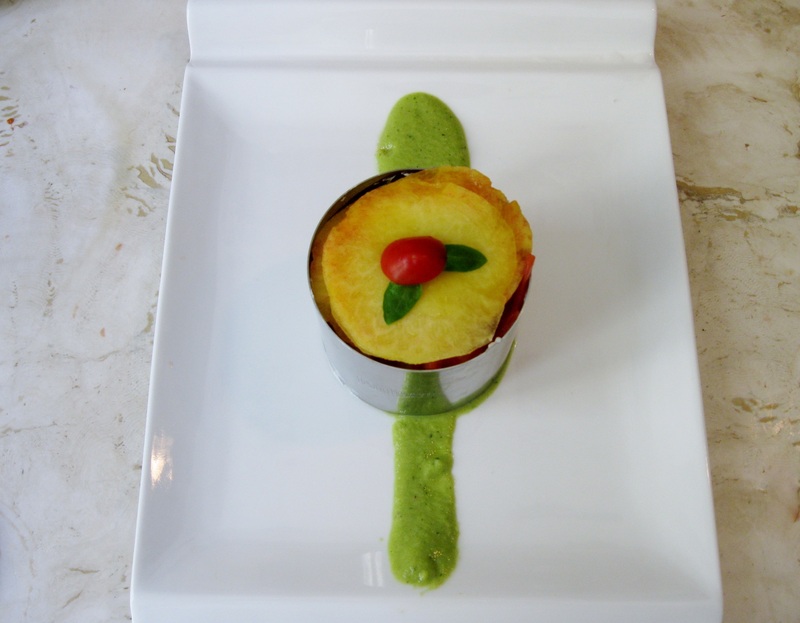 You are an artist in the kitchen! Thank you very much!!!! It is really very refreshing, specially during hot summer days like today!!! I would’ve never thought to pair peaches and tomatoes either. This looks just wonderful! I love that Italians do cool or room temp meals in the summer, makes such great sense. Love your step by step photos. Thank you!! You should really try it!!! Tomatoes and peaches are great together! Peaches and tomatoes! That’s a combination I’ve not yet tried. Sounds delicious and gorgeous presentation. 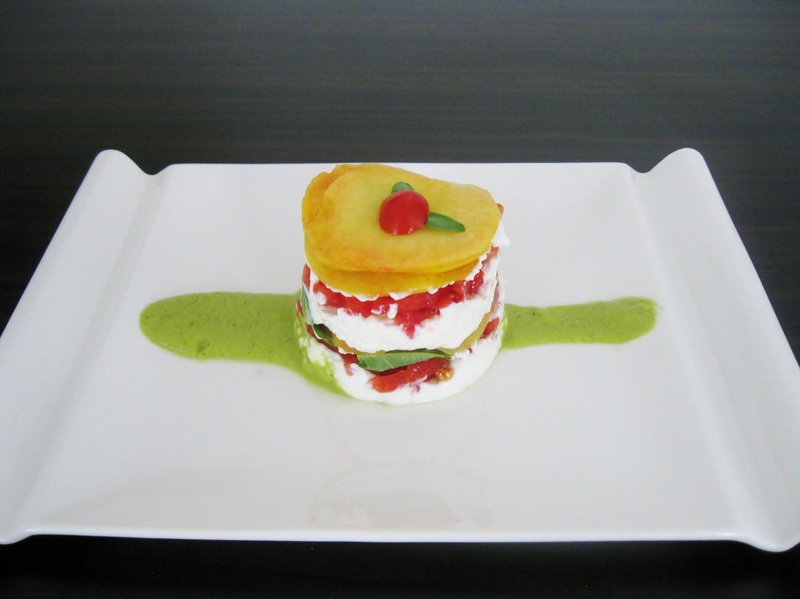 I soo love Italian dishes and am so envious of your living there!! Thank you!! You should try it!! What a pretty, pretty stack! Impressive!